Once again the Farrelly Brothers have given me great custom card material. I watched Stuck On You maybe six months ago. It's a goofy but heart warming movie about conjoined twins who have different aspirations which of course can lend to some funny situations. It's one I would call "an easy watch". The other week it just dawned on me that there were some sports scenes in Stuck On You, sort of the way you're trying to remember something but can't and then it just pops in your head out of no where the next day. I literally got a smile on my face thinking about a single card for conjoined twins. It's a custom card two'fer! Stuck On You was released in 2003. Hard to believe that was 15 years ago, but not quite old enough to match it to a card design of the same year. So, it was another case of designers choice. First was the high school baseball card. I chose a 1984 Topps baseball inspired design. I thought it would be funny to widen the head shot box to be able to get both twins in there. Since Bob and Walt are from Martha's Vineyard I decided to use the Red Sox color scheme from the '84 Topps. (Martha's Vineyard is a island in Massachusetts for the geography fans). 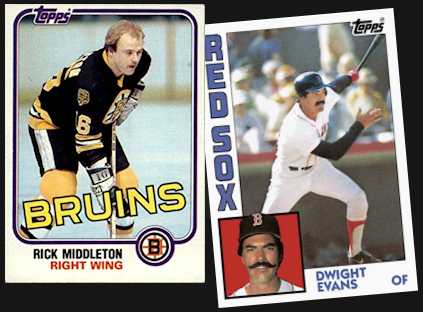 For the hockey card I went with a design I've not yet use up to this point, the 1981 Topps hockey design. 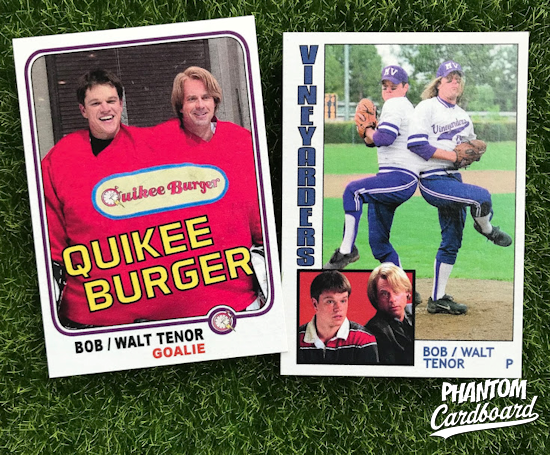 The main thing I was looking for was a card design that had a large enough area to fit "Quikee Burger", and although I had to stack it, the '81 design allowed for that. For the same reason as stated with the baseball card, I went with the Bruins color scheme for this card.